Note: This is actually a transported post from my other blog, which I wrote nearly two years ago, but I wanted to share it here nevertheless. I — mercifully — don’t work for this boss or at this company anymore. He usually wears sleeves, but the accent and attitude is still Da Bears. Ethiopian food is, as I said before, pretty much the same food we eat over here — chicken, beef, potatoes, lentils, greens, etc. — just prepared differently and with very distinct, unique spices and lots of clarified butter. 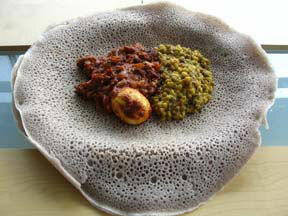 It’s also eaten without the use of utensils; you use pieces of injera bread to pick up your food. Injera is a slightly sour-tasting flatbread made from teff flour, which is very nutrient-rich and does a good job of balancing out the spicy nature of most Ethiopian dishes. Now that we have that out of the way, I’d just like to say that I’ve learned a lesson today. Don’t force Ethiopian food on good friends. It will only make them fear and resent you. Also, when you’re driving back to work, sheepishly, let them listen to the radio and don’t force them to listen to your new Coheed and Cambria CD, which also — clearly — is not for everyone. Within five minutes of returning to the office, everyone had heard about the fearsome meal. I’m not going to say that Ethiopian food is an aquired taste, because I instantly liked it from the first time that spicy, rich, earthy doro wot first passed my lips three years ago. I just think that maybe it isn’t for everyone. As my friend Aurora pointed out, it’s hard to get past that first visceral reaction to food that looks as if it were a challenge on Fear Factor. Okay, I admit that the injera does look a little like a Dr. Scholl’s insert. All of that aside, I highly recommend Blue Nile as a jumping-off point for Ethiopian food. The waitstaff are friendly and more than willing to explain their dishes to any newbies, the food is very reasonably priced (on other occasions, my friend Jacque and I have been known to split their enormous vegetarian platter between the two of us for $4.50 apiece; yeah, that’s right — $4.50 apiece!) and it’s all delicious.